Hey everybody!!!! We hope you had a fantastic weekend! I'm just sitting here with my laptop typing away while I enjoy a Banana chocolate, chocolate chip muffin! A.....ya! I'm thinking a future muffin post is in order if the sweet friend who brought them to us is willing to share that recipe! ;) Anyhu, back to subject! We spent a wonderful Friday night with our family up in Park City celebrating Bri's big 3-0! The initial intention was to get settled at the hotel and then head out for a fun dinner! But as the weather would have it, we all decided to hunker down nice and cozy and order in! We're talking major blizzard with zero visibility outside folks! Gotta love the unpredictable Utah weather! Lucky for us there is an amazing restaurant in PC that delivers called Maxwell's! And DELIVER they did! Amazing pastas, salads and pizza! You guys, if you are ever in Park City you have got to give this place a try! I don't think I will even be able do this place the justice it deserves with my wordage! The pizzas are gourmet for sure! Yummy thin crust with the freshest, most premium toppings! 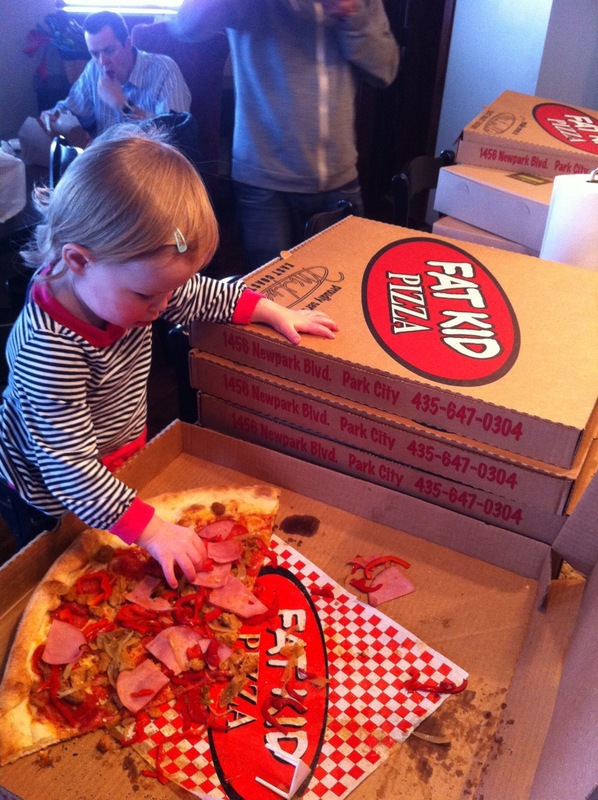 Seriously our Dad and Mom ordered eight of their largest pizzas and it was tough to pick a favorite! The classic Margherita pizza with huge slices of tomato, fresh buffalo mozzarella and basil or something just a little spicier loaded with premium cheeses, ham, sausage and jalapeno peppers! The picture below, does not even begin to show the size of these pies! I kid you not, one slice of the Fat Kids/Maxwell's largest pizza easily equals a quarter of a large at other pizza joints! Indee digging into the ham on the spiciest pizza we ordered...atta girl! Note: We've also been to Maxwell's in person and enjoyed the hip yet laid back atmosphere they had to offer! Totally worth the trip to Park City you guys! Also don't forget about Bri's awesome 3-0 giveaway ending wednesday morning! Whoa - thanks for the heads up!